146 pages | 10 B/W Illus. The 2008 financial crisis has become one of the defining features of the twenty first century’s first decade. The series of events which unfolded in the aftermath of the crisis has exposed major structural flaws in many of the financial systems around the globe, triggering a global call for legal and regulatory reforms to address the problems that have been uncovered. This book deals with a neglected angle of the 2008 financial crisis looking in-depth at the implicit effects of the 2008 crisis on the UK financial market. The book considers new trends in finance which have emerged since the crisis as well as the challenges faced by some older practices in the UK financial markets. 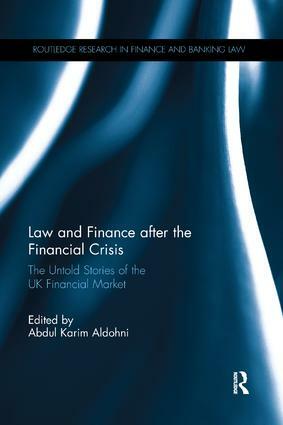 After providing a reflective account of the history of law and creditors in the UK the book investigates the proliferation of certain forms of financing that have recently become very visible parts of the UK financial market’s structure, such as high cost short term lending and peer to peer lending. It provides legal and economic accounts of these forms of alternative lending, charting their developments, current status and critically assesses their impact on the UK financial market. Also examined are the ongoing funding difficulties faced by Small and Medium Enterprises (SMEs) and the suitability of the UK current legal framework to support these institutions. The book goes on to look at the viability and safety of some other post crisis trends such as banks use of Contingent Convertible Bonds (CoCos) to improve their resilience. Abdul Karim Aldohni is a senior lecturer in Law at Newcastle University, UK.